In an interview with Yahoo Global News Anchor Katie Couric, liberal Supreme Court Justice Ruth Bader Ginsburg stated that Colin Kaepernick’s protest during the national anthem and those that do the same as “dumb and disrespectful.” She went on to say that it isn’t a crime to protest the National Anthem and no one should ever be arrested for doing so, but she opined, “I would point out how ridiculous it seems to me to do such an act.” Needless to say, Ginsburg, a darling of the LEFT, has upset the unhinged Left with her comments. It is rather remarkable that some one on the LEFT like Justice Ginsburg would have such an opinion like this but we have to remember … there used to be a time on the Left where liberals actually liked and respected America. The Democrat party used to be for the working, blue color people, not the socialist party that it has turned into today. In “My Own Words,” a new compilation of Justice Ruth Bader Ginsburg’s writings over the course her lifetime, the vim and vigor that she is famous for expressing from the Supreme Court bench is just as apparent in her high school editorials. Ginsburg has spent decades weighing in on issues most important to her — such as gender and religion — and in a new interview with Yahoo Global News Anchor Katie Couric, she did not mince words when weighing in on the current election, the state of the court and controversy surrounding the national anthem. JUST IMAGINE WHAT THE MSM WOULD BE SAYING IF JUSTICE CLARENCE THOMAS MADE SUCH A COMMENT ABOUT HILLARY CLINTON? Supreme Court Justice Ruth Bader Ginsburg crossed the line when she made insulting and partisan political comments regarding Donald Trump, the presumptive Republican nominee for president. Justice Ginsburg called Trump “a faker” who must release his tax returns and criticized the presumptive GOP presidential nominee, for having no consistency and for saying whatever comes into his head at any moment. She went on to say that Trump had an ego and could not imagine the possibility that Trump could be president. In the same CNN interview, Ginsburg suggested she believes the next president will be presumptive Democrat nominee Hillary Clinton. 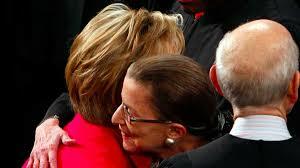 Of course there was no mention from Justice Ginsburg that Hillary was a liar and an unindicted fraud who put the United States national security at risk with the use of her private email server while serving as Secretary of State under Barack Obama. Of course not. But these bizarre comments, that certainly crossed the line, also seem to create the appearance of impropriety that Ginsburg could ever act in an non-bias manner if trump was elected President. “Every other presidential candidate has turned over tax returns,” she said. Ginsburg also criticized Trump, the presumptive GOP presidential nominee, for having no consistency and for saying whatever comes into his head at any moment. “He really has an ego,” she said. Really, who has an ego and who has no consistency and for saying whatever comes into his head at any moment? One might just say that about you RBG. How on earth could this justice ever judge a case fairly? GOP rep: Ginsburg’s Trump attacks ‘inexcusable. Rep. Lamar Smith (R-Texas) says Supreme Court Justice Ruth Bader Ginsburg crossed a line attacking Donald Trump. “It was totally inexcusable and unprofessional for Justice Ginsburg to insult a presidential candidate,” he said Tuesday on the House floor, according to The Washington Examiner. “It hurt the credibility of the Supreme Court and it showed bad judgment. My personal opinion is that this may just backfire on the LEFT and be just what Donald Trump needed just ahead of the GOP National Convention in Cleveland, Ohio. These are the kinds of things that the GOP needs to be slapped upside the head with, especially the establishment and Never-Trumpers. We all know the political system is rigged, now we are witness the the SCOTUS being rigged too. Justices are never supposed to dabble in the political rhealm for the appearance of bias when ruling on cases. So much for that now. 83 year old RBG embarrassed herself and as Slate reported, may have risked her legacy to insult Donald Trump. These comments will most certainly be spoken at the RNC and all will be reminded that elections have consequences. Numerous SCOTUS positions will most likely be nominated by the next president, RGB being one of them. Remember when Supreme Court Justice Ruth Bader Ginsburg was caught on camera dozing off during Barack Obama’s SOTU? 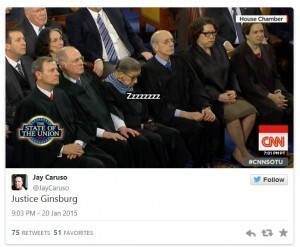 Ginsberg was seen nodding off about 20 minutes into Obama’s 59-minute speech of bovine scatology. It turns out she was not just sleepy and bored from Obama’s blathering, the 81 year old Justice admitted she wasn’t “100% sober”. YOU GOTTA LOVE IT!!! 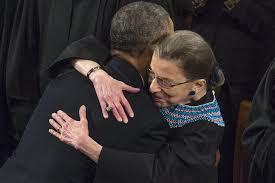 Hey Justice Ginsberg do not worry, most of America cannot listen to this president without being drunk as well. As a matter of fact, we have drinking parties during Obama’s SOTU’s to be able to get through them. Obama said, “I” or “me” … DRINK! Obama just provided another give a way and called it free … DRINK! What other way could you listen to Obama lecture and lie for nearly an hour without being hammered? Supreme Court Justice Ruth Bader Ginsburg admitted that she wasn’t “100 percent sober” when she dozed off during President Barack Obama’s State of the Union this year. “The audience for the most part is awake, because they’re bobbing up and down, and we sit there, stone-faced, sober judges. But we’re not, at least I wasn’t, 100 percent sober,” Ginsburg told an audience at George Washington University in Washington, D.C., Thursday night.